One of the things that we pride ourselves the most on here at Bespoke Door Installations is that we can offer an almost unmatched selection for our customers when they are choosing their new front door. Colours, styles, windows, frames and more can all be customised to meet exact specifications. This is exactly what one of our recent customers did for their brand new front door – this stunning Irish oak door fitted in Rotherham. Fitted supplied and fitted by our team, this door was designed by the home owner themselves using our design a door tool, so that they could get the perfect door to suit their tastes exactly. They chose an attractive Irish Oak finish, with black brown frame, letter plate and handle, and 3 glass windows. As with all of the doors that we fit, this was a composite door, which means that it was much more durable, secure and energy efficient than standard wooden or UPVC doors. Furthermore, as part of our own secure guarantee, the homeowner will receive £500 of cashback if the door is ever broken in the event of a break in. As always, we surveys and fitting were included as standard, and we took the old door away to be disposed of too. See below for photos of the fantastic Irish Oak Door fitted in Rotherham by our team. 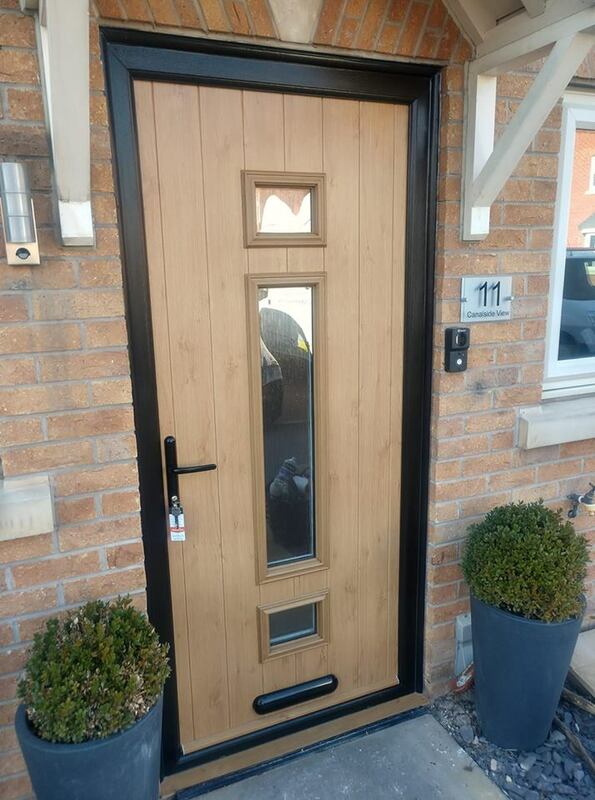 For more information regarding the genuine composite front and rear doors fitted in Rotherham by our team, please don’t hesitate to give us a call today on 01623 325000, or why not give our design a door tool a go and create your very own bespoke door. We typically served a 25-30 mile radius around the Mansfield area, but we can also offer supply only doors, and in some cases can travel further, so if you’re unsure please don’t hesitate to get in touch. Bespoke Door Installations specialise in providing the highest quality composite doors, with excellent fitting and an affordable price. All posts are written by our installers who have at least 10 years experience and are fully qualified with NVQ level 2 qualifications in installation of windows & doors, along with being FENSA registered.